Insurance group: 16 - 25 How much is it to insure? 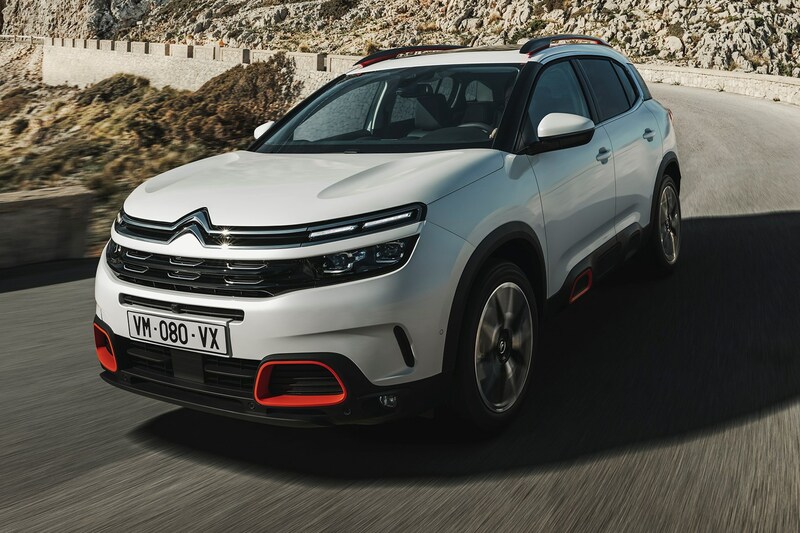 The Citroen C5 Aircross joins its similarly badged C3 sister car to help increase the French car company's line-up in the super-competitive SUV market. It's going to have to be good to make a dent in a sector that's so crowded – with cars such as the Volkswagen Tiguan, SEAT Ateca and Ford Kuga already proving so popular. 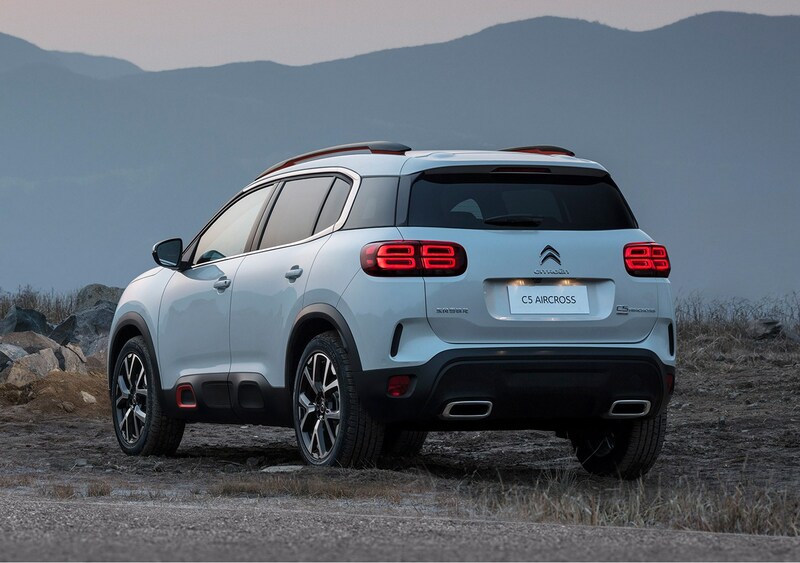 It’s not Citroen’s first crossover of recent times: the distinctive C4 Cactus has been on sale since 2014, although it was repackaged as a more conventional hatchback in 2018, while the seven-seater C-Crosser was a clone of the previous-generation Mitsubishi Outlander. 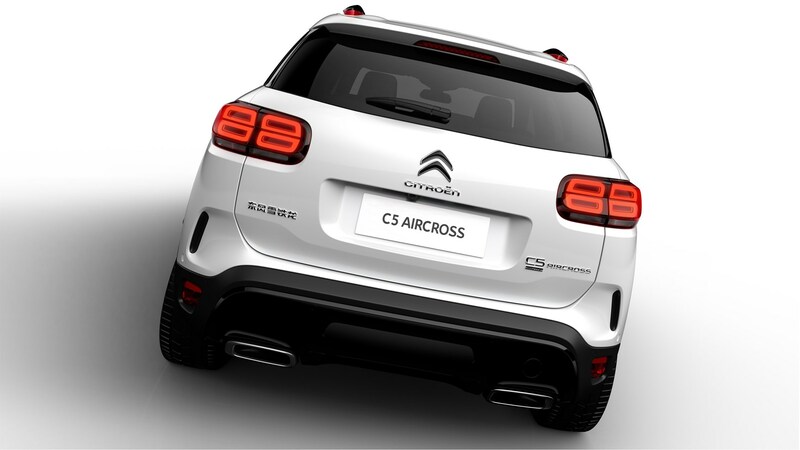 But the C5 Aircross is an altogether different proposition, heading right for the medium-sized family SUV market. At 4.50m in length it sits between the Peugeot 3008 and 5008 in terms of size - SUVs it shares much of its underpinnings and mechanical components with. Similarly, it’s closely related to not only the DS 7 Crossback, but also the Vauxhall Grandland X. 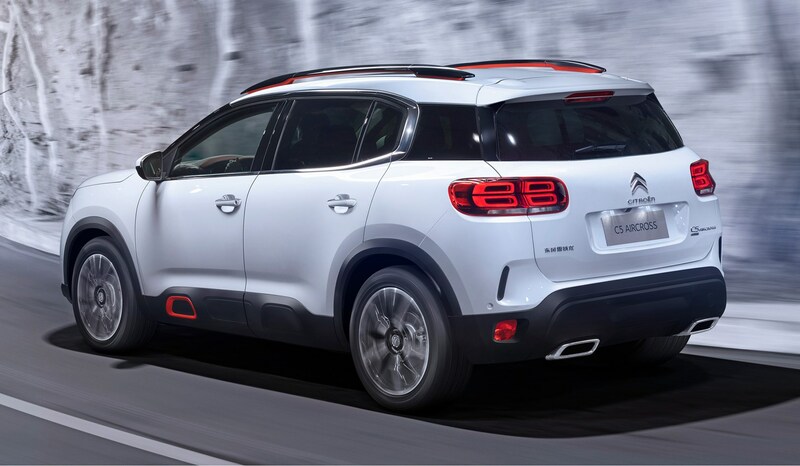 As with the recently facelifted C4 Cactus, the C5 Aircross majors on comfort and style, and is also available with a raft of personalisation options, which prove so popular with family car buyers. 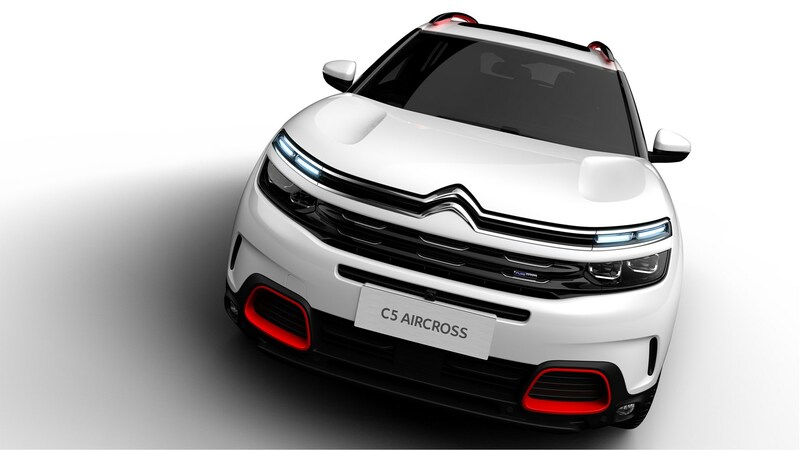 What makes the 2019 Citroen C5 Aircross different? Citroens are renowned for their ride comfort, a trait the company’s bosses are keen to focus their attention on with forthcoming models. 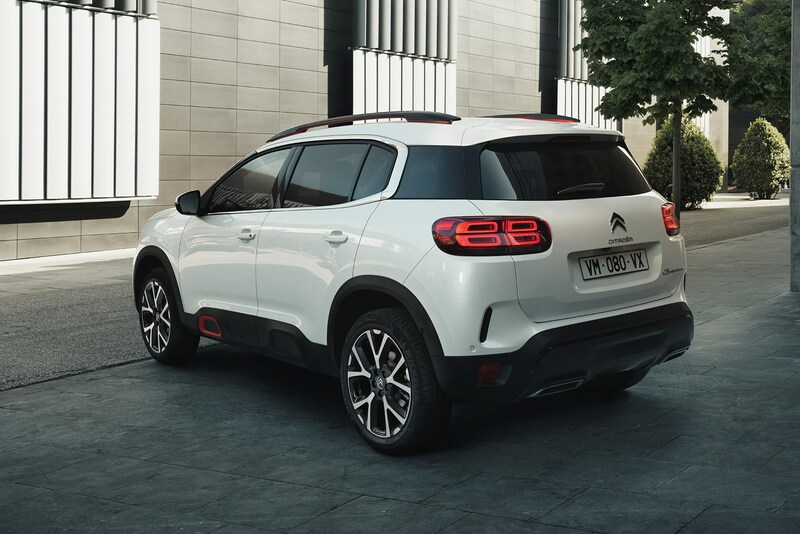 The C5 Aircross is the first model designed with the Citroen Advanced Comfort philosophy in mind from the outset, although the revised C4 Cactus hatchback also has some of these developments retrospectively installed. Chief among the hardware changes is a suspension set-up with what Citroen calls Progressive Hydraulic Cushions. 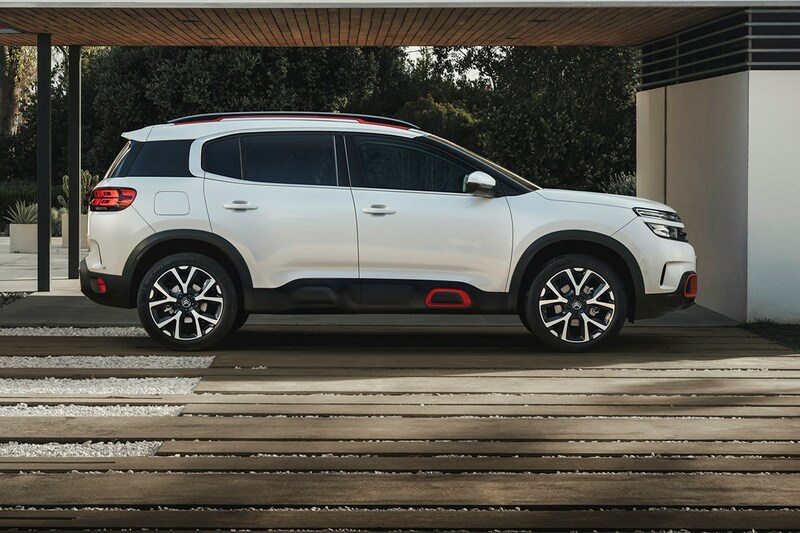 It doesn’t completely replicate the famed ‘magic carpet ride' of hydropneumatic Citroens of old, but as we'll see, it does iron out the majority of surface imperfections without making the C5 Aircross list like a ship whenever you encounter a corner. 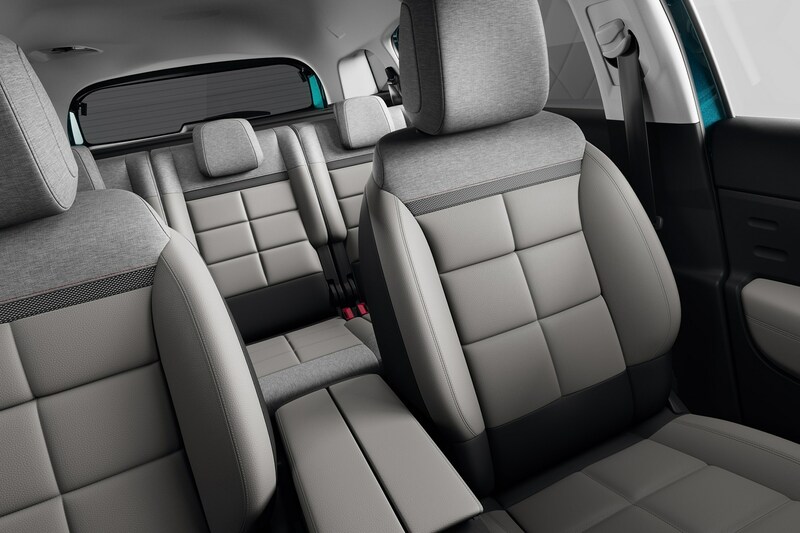 Furthermore, Citroen’s equipped the C5 Aircross with soft and supportive sofa-like seats with a massage function, optionally available for the front pair. There's also a reclining backrest function and seat slider for the three individual seats that make up the rear bench. 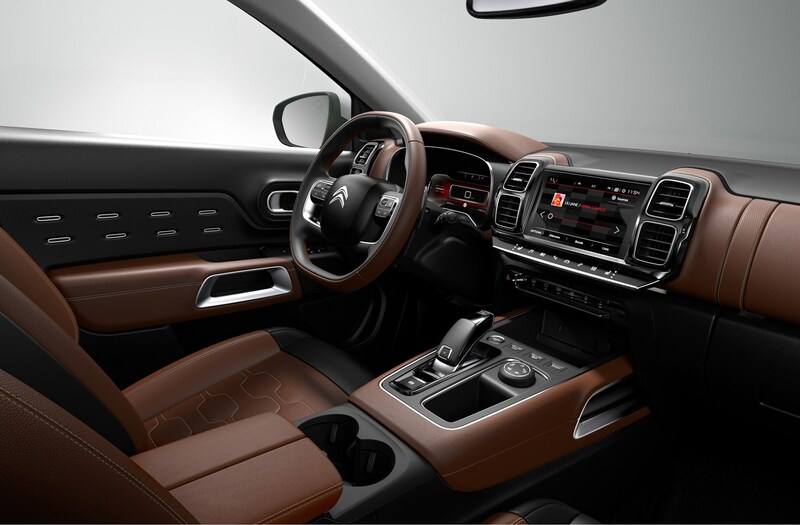 The cabin is trimmed in soothing hues, and all of the touchpoints look and feel durable and of a decent quality. Double-glazed acoustic-insulating glass will also be available. 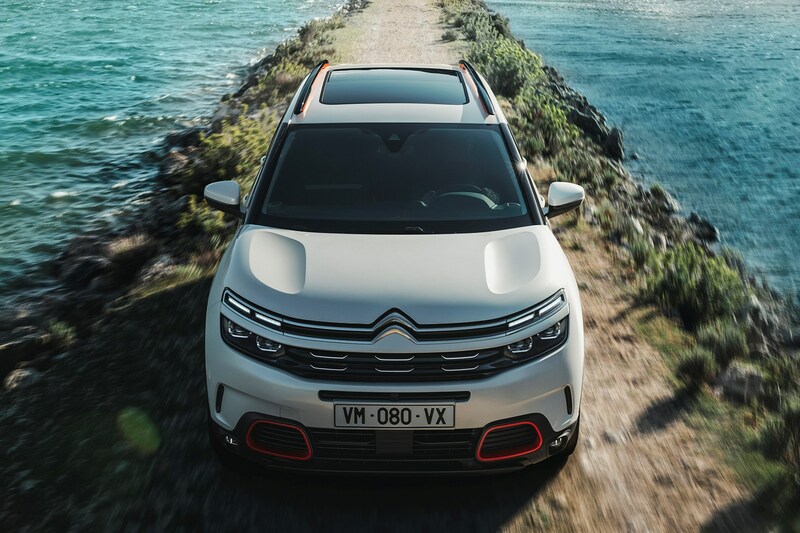 Recent hallmarks of Citroen’s distinctive design language are present and correct with the C5 Aircross, not least the eyebrow-like LED day-running lights with main headlamp units nestled separately below. 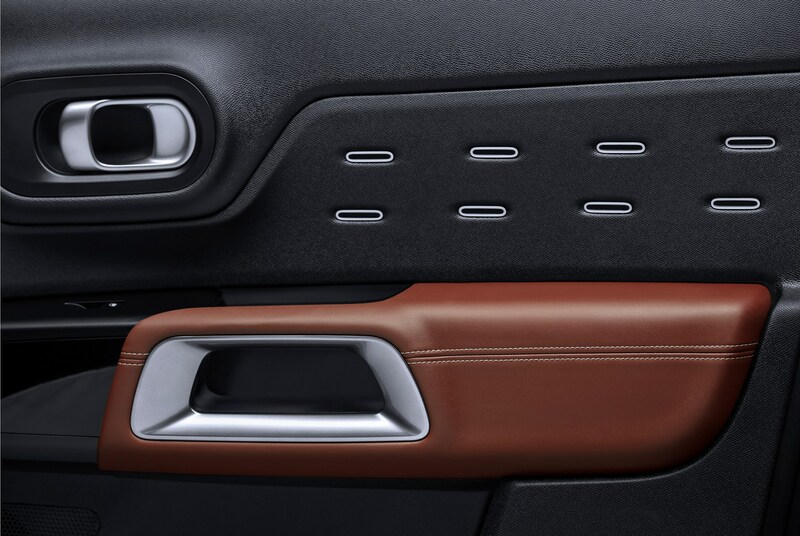 There's also a smattering of Airbumps – think toughened bubble wrap – along the lower edges of the doors for a dash of rugged protection. 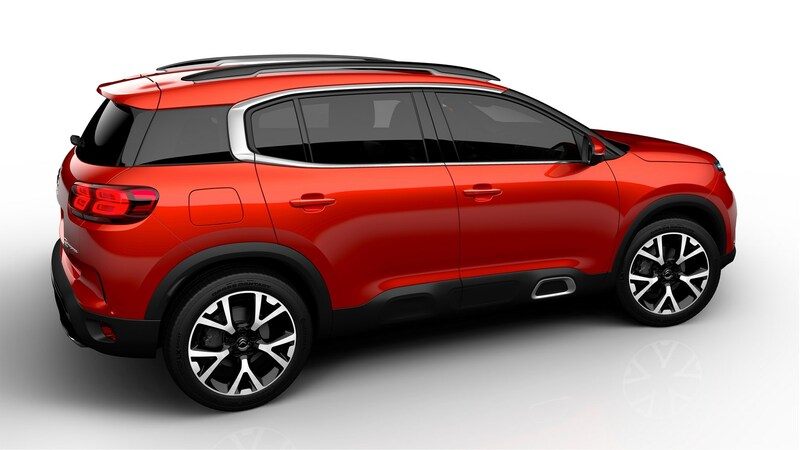 Unique – so far, at least – to the C5 Aircross are the chrome-look hoops around the side-door windows, with a subtle third piece of glass appearing blacked-out towards the back. LED-rich tail lamps are bisected by a wide-opening tailgate, while the exterior can be spruced-up further with flashes of red detailing. 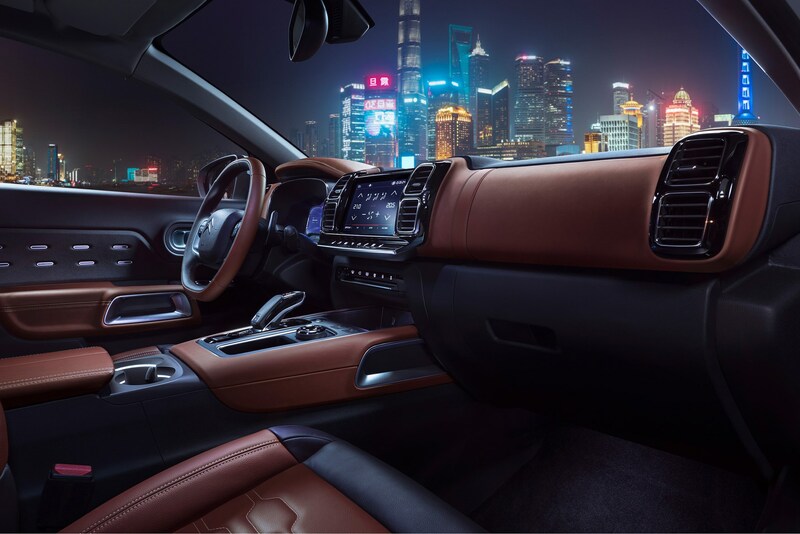 There’s an upmarket look to the distinctive cabin, boasting a 12.3-inch infotainment screen on high-spec versions, with a wide centre console and an electronic instrument binnacle directly ahead of the driver. 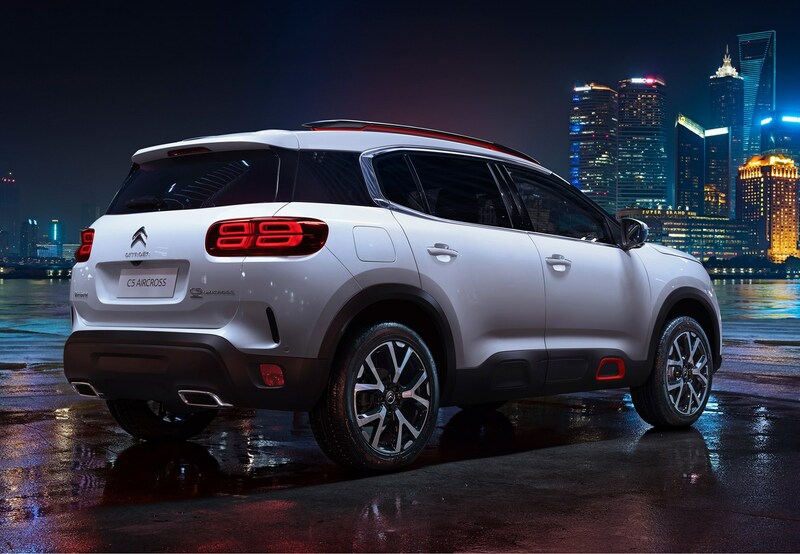 For launch, the Citroen C5 Aircross will be available with a range of latest-generation Euro 6.2 engines and come in petrol-powered flavours: PureTech 130 S&S six-speed manual and PureTech 180 S&S EAT8. There will also be three diesel versions: the BlueHDi 130 six-speed manual, BlueHDi 130 S&S EAT8 and BlueHDi 180 S&S EAT8. 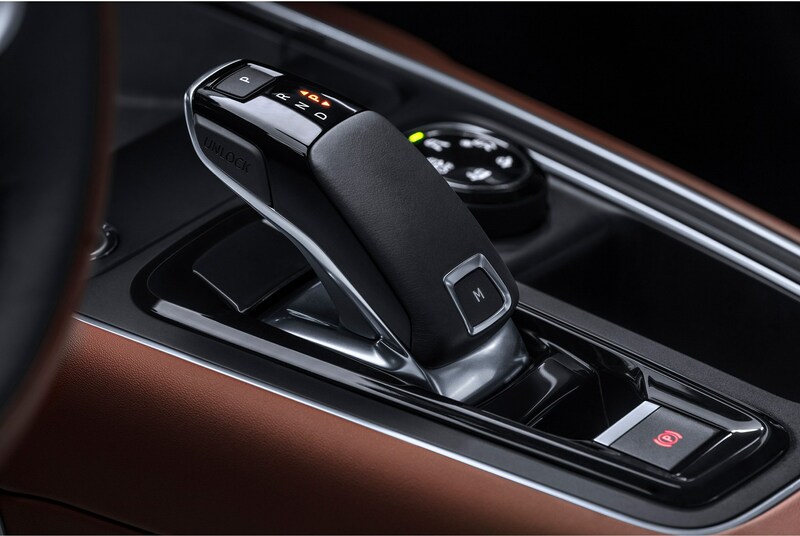 Citroen says that the new eight-speed auto is 7% more efficient than the outgoing six-speeder. Also confirmed is that the SUV will be available with a 300hp petrol-electric plug-in hybrid powertrain shortly after launch; the only model in the range with four-wheel drive. It has a battery-only range of 40 miles, and joins the range in late 2020. 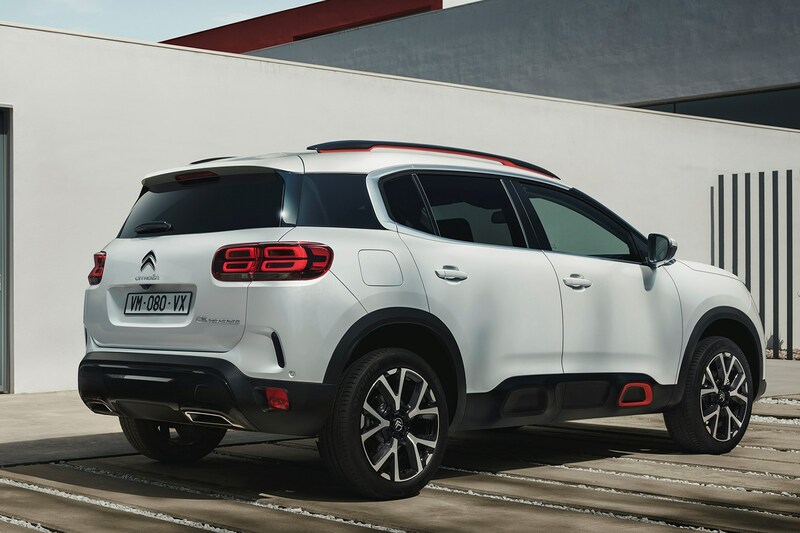 Citroen expects that the sales split between petrol and diesel in the UK with be a straight 50/50 – a solid reminder of how the family car market is changing to reflect the views of buyers who are keen to leave the diesel fold. There are no pared-down entry-level models. Instead, there's a three-tier range, starting with the Feel version. 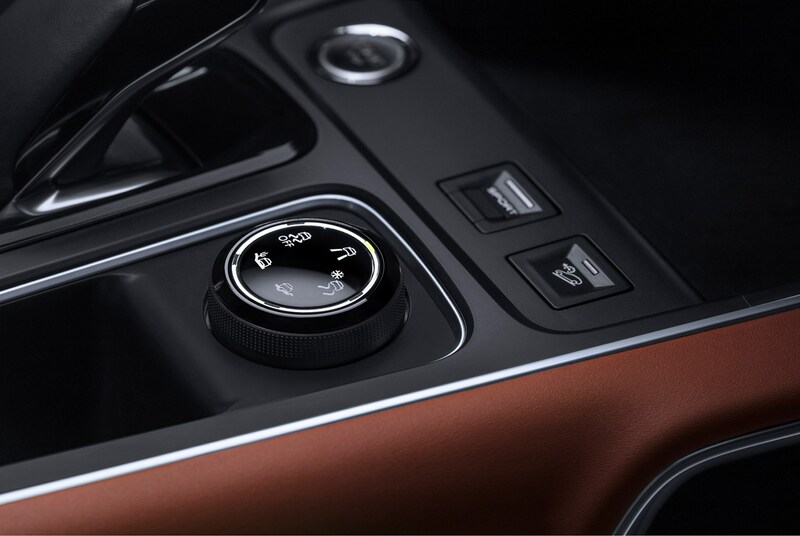 That comes with 17-inch wheels, 12.3-inch digital instruments and an 8.0-inch touchscreen. This model is only available in 130hp PureTech and BlueHDi engines. Next up is the Flair, which includes 18-inch wheels, front parking sensors, a reversing camera, the Advanced Comfort seats as standard, a sat-nav upgrade, tinted glass and leather and cloth upholstery. 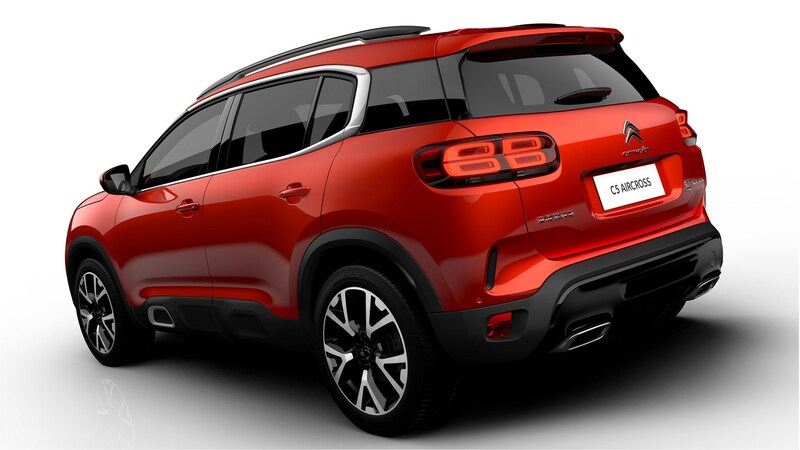 This is the model that Citroen expects to sell the most of in the UK. Connected online services are available, as will a host of driver-assistance systems tasked with preventing you from being involved in an accident. Highway Driver Assist: combines Adaptive Cruise Control with Stop and Go and the Active Lane Departure Warning System to manage driving semi-autonomously in specific driving conditions. 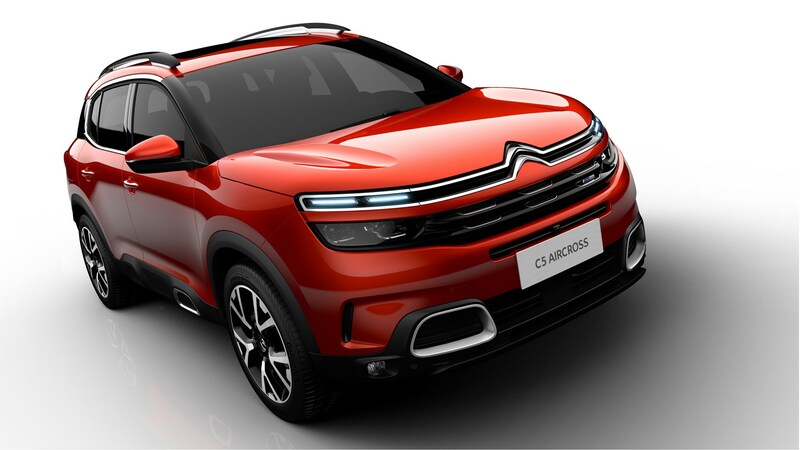 What's the Citroen C5 Aircross like to drive? We drove both the PureTech petrol and BlueHDi versions in range-topping 180hp form, and both impressed for different reasons. In the case of the diesel, it pairs up well with the EAT8 transmission, resulting in a relaxed, laid-back driving experience that complements its overall refinement. It never feels fast (0-62mph in 11.5 seconds), just long-legged. The PureTech petrol is refined and punchier (0-62mph takes 8.2 seconds) and also suits the nature of the C5 Aircross. Again, not quick feeling on the road, but more than happy to roll along at motorway speeds without feeling at all stressed. Out of the pair, we'd forego the range and ultimate economy of the diesel version and head straight for the petrol because of its refinement and willing nature. We'll wait to give a definitive verdict until we've driven the 130hp twins, but given how good the 1.2-litre PureTech petrol is, we're willing to bet this one will be the star of the range. Is the C5 Aircross as comfortable as they say? Yes. 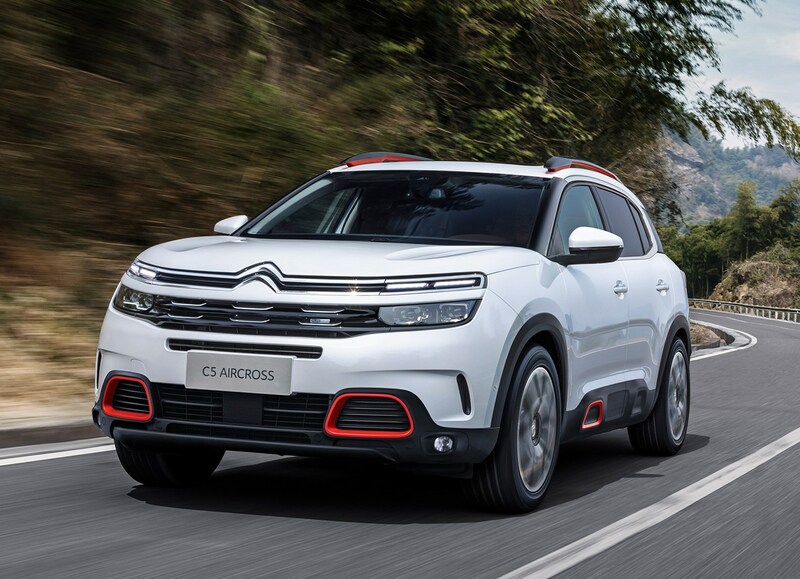 Keen drivers might not warm to its unsporting nature, but for those who value ride comfort, the C5 Aircross delivers all that's been promised of it. Those Progressive Hydraulic Cushions really do their stuff – we tested the car on a number of different road surfaces and situations, and rarely did it feel flustered. Most impressive is the way the C5 Aircross deals with changes from big dips and bumps to small imperfections, taking them in their stride. Little in the way of road noise is transmitted into the cabin, even when tackling the most brutal ruts and potholes. It really is a relaxed drive. If you carry lots of passengers, and like to crack on, you might not agree with the amount of bodyroll in bends. Equally it can pitch on undulating surfaces, although the body control is actually very good. Dial it back, though, and the comfort wins over – it's not a car to rush around in, and makes no bones about it. 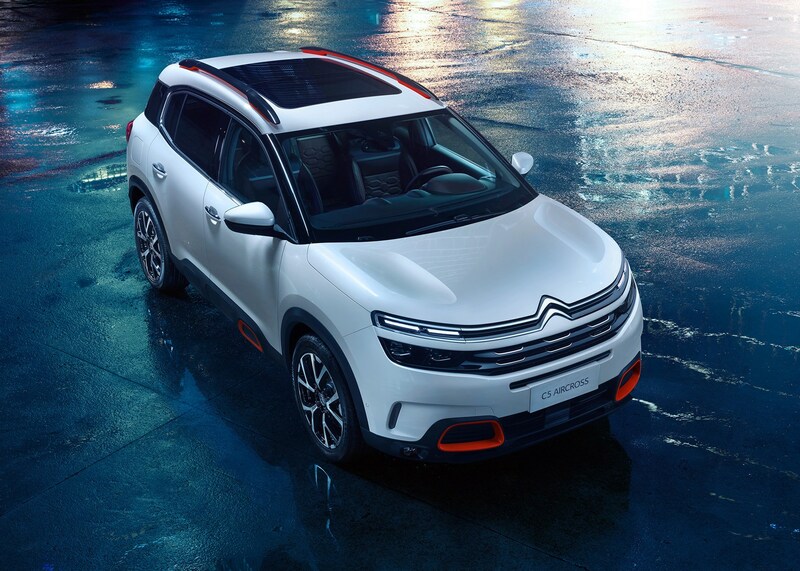 What’s the Citroen C5 Aircross like inside? 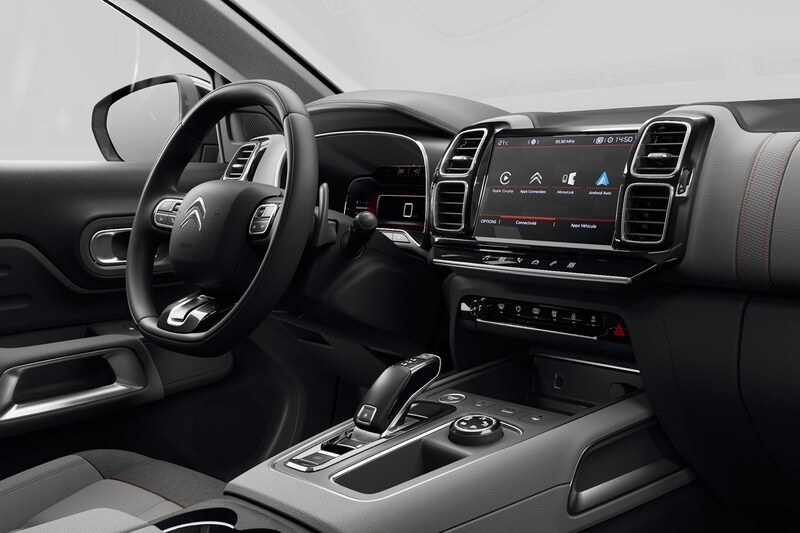 The controls and driving position are all pretty much as they are in the C5 Aircross’s PSA cousins, which is to say that you'll enjoy it if you like your secondary controls (such as heating and climate control) principally driven by the central touchscreen. We don't, especially one that lacks responsiveness and usability like this one. There's bags of room upfront and in the rear, with a very generously proportioned central cubby, which is more than capable of taking all of your paraphernalia. 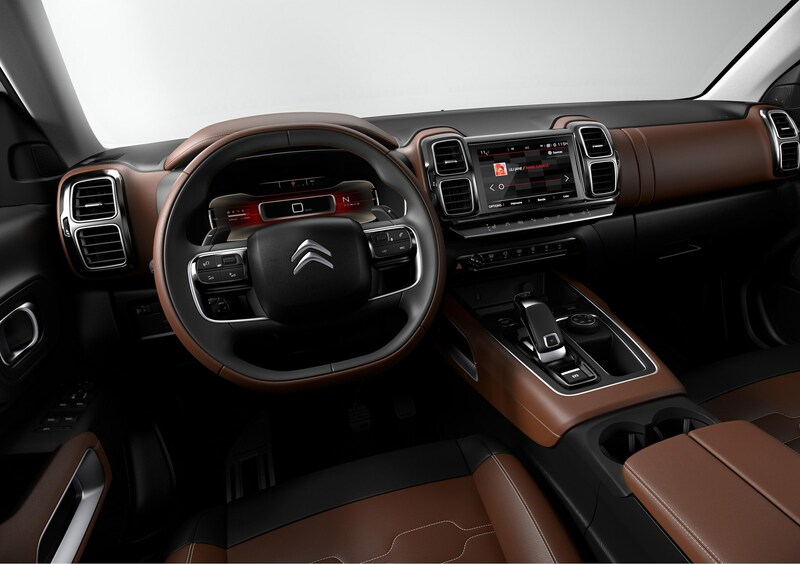 Impressive aspects are the squashy, yet supportive, seats, and the interior quality, which has taken a big leap over Citroens of old, and should now be considered up there with the class leaders. But in the pursuit of quality, none of the design flair that you'd expect from a flagship (for now) Citroen has been skimped upon. 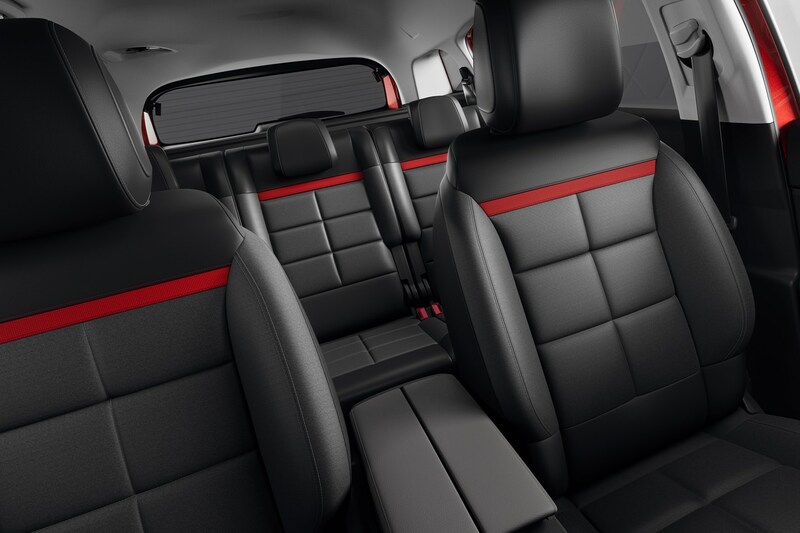 The rear is roomy for three passengers, and the adjustable, reclining seats back there serve a decent purpose. Sadly (for now) there's no seven-seat version, which means you'll need a Peugeot 5008 if you're looking to shift more people. 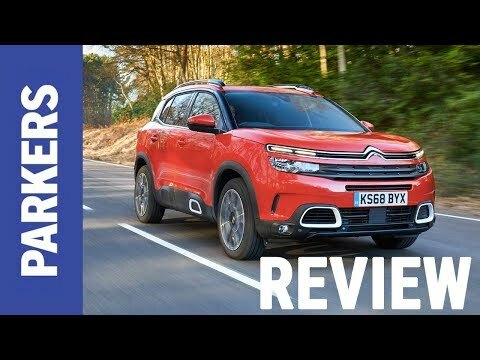 Should you buy a Citroen C5 Aircross? Yes, if you're after a family-oriented SUV that majors on comfort over dynamic prowess. If comfort floats your boat, here's where you should put your money. It's stylish, too, with a chunky look, and individualistic front end that means you won't be confusing it with any of its (myriad) rivals. Equally, it's roomy and efficient, too. 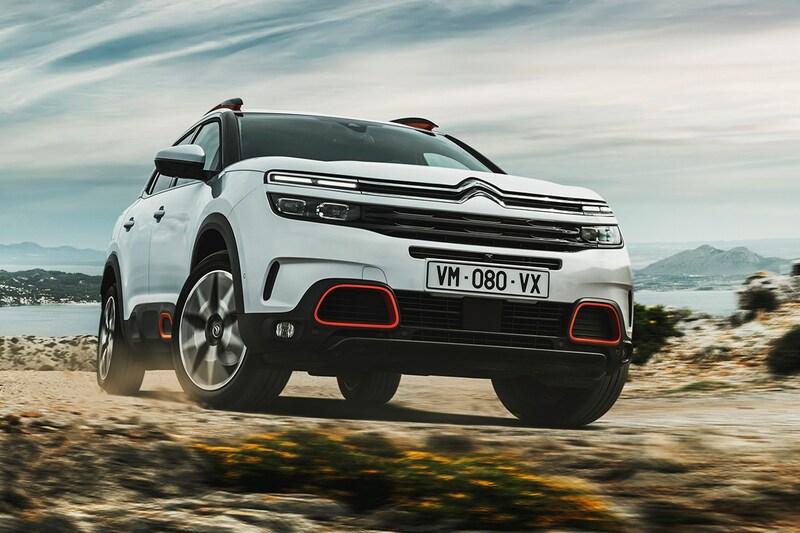 Given Citroen's recent strides in build quality and reliability, we'll say that it's a safe and reasonable choice that will find appeal with those who are wowed by its fresh looks and stylish interior. The added comfort merely adds to the appeal for those struggling with Britain's pothole-riddled roads. It won't work for everyone – some people like a firm ride and sporting handling, even in the most family-oriented cars, but for those who don't, this soft-riding SUV comes highly recommended.